Our first stop is Rickey’s Café with a spectacular view of Grace Bay beach, next to Club Med and the Craft market whilst enjoying a cocktail. Next stop is the Conch Farm where you will enjoy a guided tour of the farm, the only harvesting facility for conch . Learn all about conch and even meet their mascots Sally and Jerry – the WORLD’S only conch farm and domesticated conch. Following the Conch Farm, Providenciales has many interesting and unique places to see. You will be delighted to experience one of those places on the fly on every tour. We will in essence be opening Provo’s best kept secrets. 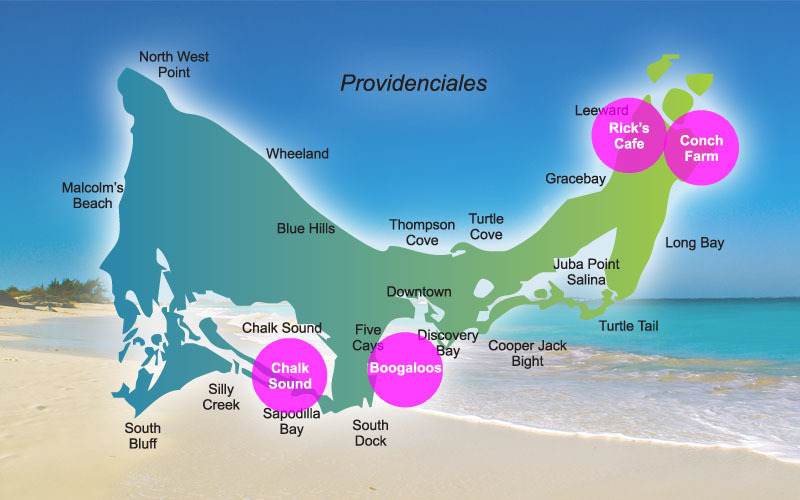 After discovering the secrets , we will head to Chalk Sound , where we will stop to photograph the most amazing coloured waters in the Caribbean. Our last stop is a classic beach bar where you will enjoy a full lunch.